You are currently browsing the tag archive for the ‘FableCroft’ tag. Epilogue is the latest offering from Fablecroft Publishing, an Australian small speculative fiction press that specialises in themed specfic anthologies. For this volume, editor Tehani Wessely has chosen a strong cast of notable Australian writers as well as one stray Swede, Kaia Landelius. Originally titled “Apocalypse Hope”, Epilogue asks “what happens after the apocalypse?” Many of the stories herein have an optimistic bent to uplift us from the all-too-dystopian world we live in. 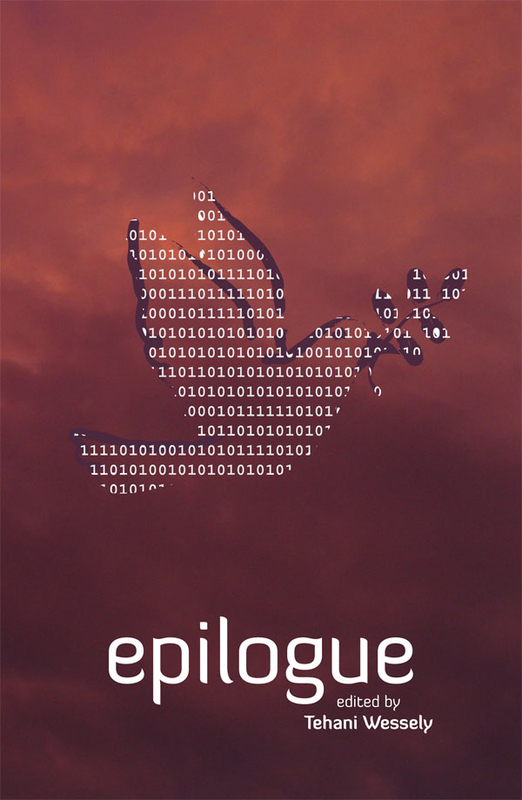 Epilogue is professionally presented and features commanding cover art from Amanda Rainey, whose work adorns plenty of Australian specfic covers these days. With Epilogue, Fablecroft firmly establishes itself alongside Twelfth Planet Press and Ticonderoga Publications at the forefront of Australian speculative fiction publishing. Thoraiya Dyer’s “Sleeping Beauty” opens proceedings, and it features an apocalypse in progress that our voracious protagonist can survive but not prevent. Rather enigmatic in style, Dyer’s brief tale is nevertheless atmospheric and exceedingly well written. Jo Anderton’s ”A Memory Trapped in Light” is rather different but equally impressive in an entirely different way. Isola and Ruby are sisters living in a nightmare future of Legate Drones, Pionic Flares, Shards, imprisoned children, ancient laser cannons and the Crust. Channelling SF films like The Matrix and Spielberg’s War of the Worlds, as well as the classic SF stories that underpin those works, Anderton has constructed an exuberant and positively traditional SF story with strong female central characters, something that rarely featured in the Golden Age imagination. There’s a paucity of genuine science fiction in the Australian specfic scene currently, but the work of Jo Anderton would appear to be a significant exception. 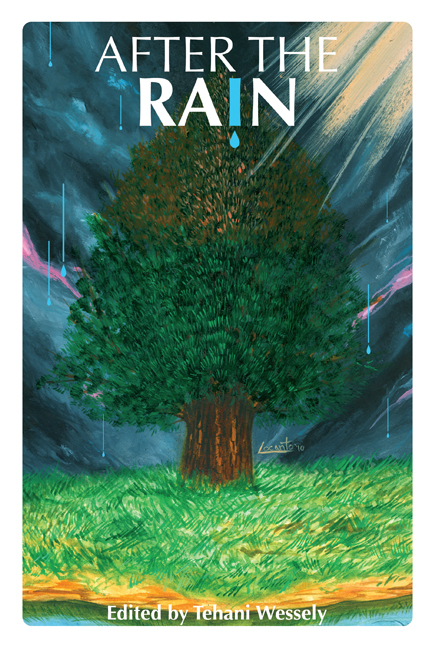 After the Rain was in an advanced stage of production at the time of the 2011 Queensland floods; a version of the anthology was published electronically to raise funds for the resulting appeal. It is important to note that the electronic version was not exactly the same as the hard copy reviewed here – for example, there were fewer stories, and some stories were not in exactly the same form as they appear here. Therefore, even if you have the electronic version, you may wish to consider also purchasing the hard copy. A difficulty that often occurs with anthologies is the theme. Too tightly interpreted, a theme can result in a bunch of exceptionally similar stories which quickly become boring; too loosely interpreted and you can start to wonder what these stories are doing in the vicinity of each other. This first (and often largest) pitfall is one that Wessely and her authors have avoided. The stories here have links to the theme of varying intensity, some closely, some less obviously; this variety helps to produce an anthology of interesting and diverse stories that nevertheless make sense together. Only one story seems to lack much connection to the theme – “Heaven”, by Jo Langdon. Although not a bad story, it was the one that stood out to me as seeming least connected to the theme. I finished it wondering how it had found its way into this anthology as there was, for me, no obvious connection to the theme. 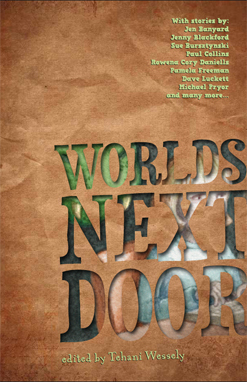 Worlds Next Door is a fab little anthology of Australian spec fic for kids. A quick look at the contents page and you’d be pretty surprised if it wasn’t a good read — the editor has assembled an enviable list of contributors well known in specfic circles. As with any anthology, there were some stories I liked more than others — but there were no clunkers. I enjoyed each and every one, it’s just that some shone for me, whiles others were merely a pleasant read. Overall, I love the fact that none of the stories try to dumb things down for the target readership… which, of course, has the side-effect of making them very readable for an adult audience as well. The stories are intelligent, sometimes challenging and always entertaining.